In this article we will focus on: 1. How to Create Custom Web Server Control. 2. Adding the Custom Web Server Control to the Toolbox and using this newly created Custom Web Server Control from the Toolbox. 3. Consuming Custom Web Server Controls in a Website. 1. How to Create Custom Web Server Control. 2. Adding the Custom Web Server Control to the Toolbox and using this newly created Custom Web Server Control from the Toolbox. 3. Consuming Custom Web Server Controls in a Website. Easier to use than User Controls. We can define a complete design time experience for the consumers of our Custom Web Server Control such as ToolBox support and designer functionality. Only drawback is we will end up writing more code than the User Control code. If you want to reuse a control across websites then go for Custom Web Server Control. 1.A Custom Web Server Control is a control that inherits from either an existing Web Server control or from the WebControl class. 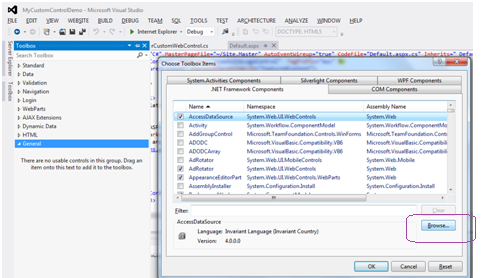 2.We can compile the control into a separate dll file that can be either be shared among applications or we can also deploy it into GAC. a.Create a web server control that inherits from the WebControl class that provides a basic functionality. This way needs lot of work to develop this control. b.Inherit from an existing Web Server control that provides the core features required for the control. Here we can focus on additional functionality required for the control. In this article we will see both the approaches of creating a Web Server Control. 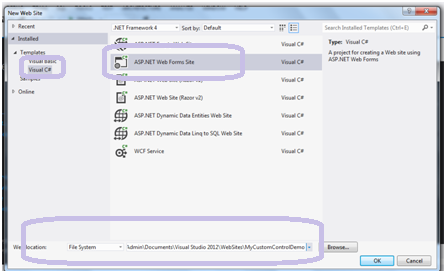 First Approach: Inheriting the Custom Web Server Control from an Existing ASP.NET Web Server Control. Let us create a control that includes a Label and a TextBox. We will name this control as "UserCustomWebControl". User can set the Text of the Label which would label the TextBox(UserName and Password). We will allow the developer to set the text of the control(Label). 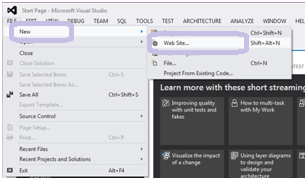 Open Microsoft Visual Studio -> Create a New Website ->Select Visual C# under Templates on the Left pane -> Select ASP.NET Web Forms Site -> name it "MyCustomControlDemo". 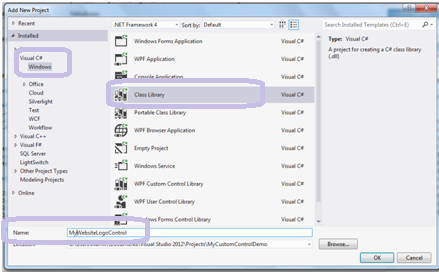 Step 3:Inherit the class from the TextBox class. 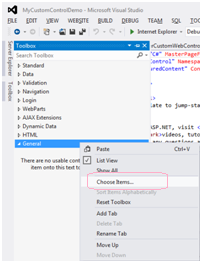 Step 4:Add the below two properties for Label Width and Label Text. As our custom control inherits from TextBox control, the TextBox properties are exposed by default. Render method uses the HtmlTextWriter to write the display of the UserControl and the base rendering of the TextBox control. Step 6:Build the Class Library and add its reference to our website so that we can use this server control on our webpage. LiteralControl br = new LiteralControl("
In the above code we are writing code in the Page_Init event handler. Page_Init event is raised after all controls of the page have been initialized. 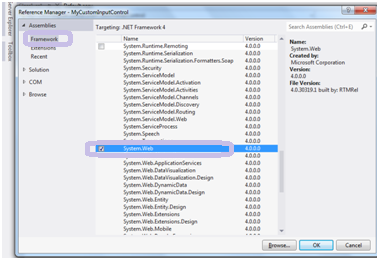 Since Default.aspx page uses a masterpage. First we will get referene to the ContentPlaceHolder "MainContent" in which all controls will be placed. Then we will create an instance of our Custom WebServer control "UserCustomWebControl" and then initialize its Label Text and Width properties Then we will add this custom web server control to the Controls collection of the ContentPlaceHolder. 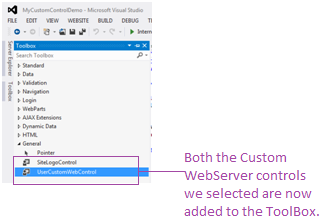 Similarly we will create another instance of our Custom WebServer control "UserCustomWebControl" and then initialize its Label Text and Width properties Then we will add this custom web server control to the Controls collection of the ContentPlaceHolder. This time we will set the TextMode property of the Textbox to Password so that password is not visible in Text format. We will also set the Width of the TextBox to 150px. As you can see TextBox properties are available to us by default as our custom webserver control is inheriting from the TextBox class. We are also adding a newline after the first custom webserver control to display the second custom webserver control on the next line. Press Ctrl + F5 to build and run the website. You will see the output with the render Custom WebServer control. RenderBeginTag:Used to render HTML at the beginning of the control. RenderContent:Use this method to ensure that HTML of our control is rendered correctly between begin and end of the HTML tags. RenderEndTag:Used to render HTML at the end of the control. 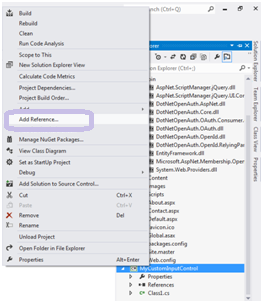 called and will render an end tag based on the supplied begin tag. 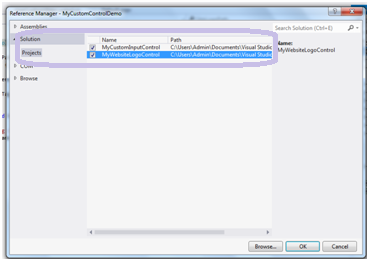 Create a Class Library project in the solution as shown above and name it "MyWebsiteLogoControl". 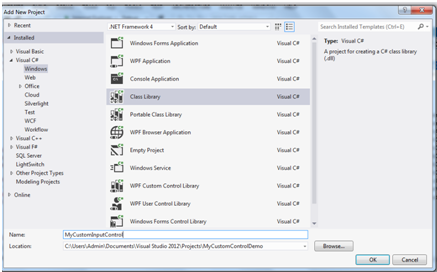 Add reference to System.Web assembly in this class library. In the above code we are rendering image tag with the custom website logo(image)and site name in a div tag. The ending of the div tag is automatically rendered in the RenderEndTag event. 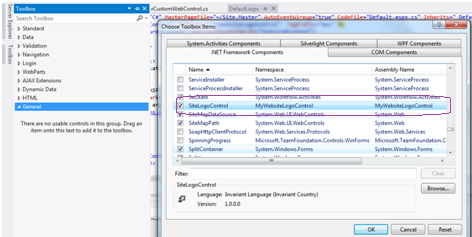 In the default.aspx page, Add the following register directive to register the custom webserver control as a dll file. Go to Default.aspx page ->Open ToolBox window -> RightClick under "General" category and select "Choose Items" -> Click on Browse ->Navigate to the folder where our Custom Web server control(Class Library) dll file is present -> select the class library dll(MyCustomInputControl.dll) -> similarly select another custom webserver control dll(MyWebsiteLogoControl) we created above and click on ok. This adds both the custom controls to our ToolBox. I have demostrated all these steps in the below screens. 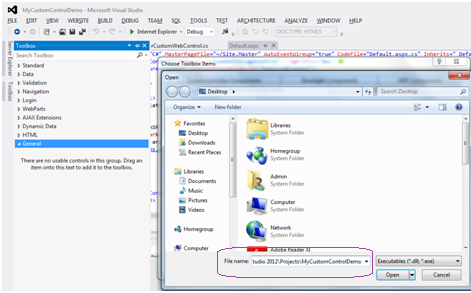 Now Select Browse to select the custom WebServer control dll file from the Debug folder of the Class Library project. As you can see in the Below screen both the Custom WebServer controls as added to the ToolBox.Now Click on OK button. Now we can Drag and Drop these controls in our Web Page and use them like any other Web Server Control. Isn't so easy to create a Custom Web Server Control?